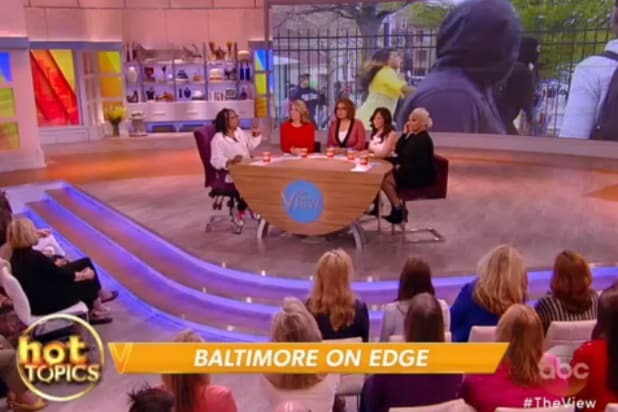 “The View” hosts are praising the Baltimore mom heralded across the country for stopping her son from taking part in Monday’s protests, saying it was class, not race, that caused tension to boil over in Charm City. Perez pointed out that public schools are funded in large part by property taxes, so the poorest neighborhoods are usually home to the poorest schools with meager means to educate students and enable them to rise up out of poverty. “I hope the conversation goes where you just took it,” Nicolle Wallace added, saying that problems with police violence need to be addressed, but communities need to be safe to attract residents and raise property values — like Rudy Giuliani did with New York in the 1990s. Whoopi Goldberg added that the change begins with women like Toya Graham, who’s been dubbed America’s “Mom of the Year” after a video went viral showing her grabbing her teenage son out of a group of rock-throwing protesters and smacking a little sense into him. “It starts with this woman who went and got her kid, who said, ‘We’re not doing that,'” Goldberg said, adding that parents should teach their children to take pride in their community.